Not available for shipping. Local pick-up only. 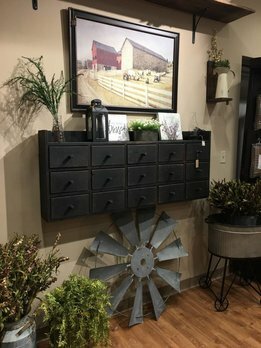 At Nana's Farmhouse you'll only find the highest quality furniture and merchandise to blend with your Farmhouse Style. 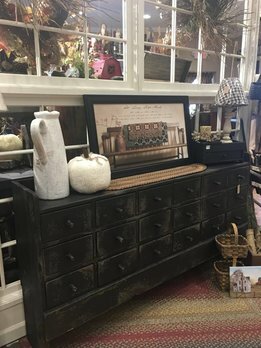 This distressed Apothecary Cabinet is a timeless addition to any country home! Distressed and made of solid wood in the USA. You'll love the 12 drawers for storage with extra storage below behind the two doors. Great in any room. The Wingback Chair is a classic addition to your country home. Made of 8 way HAND-TIED coil spring with a hardwood frame construction. Made in America. It has a single removable cushion & chippendale legs. Pick your fabric or pick the chair in-stock! The Tight Seat Chair is a classic addition to your country home. 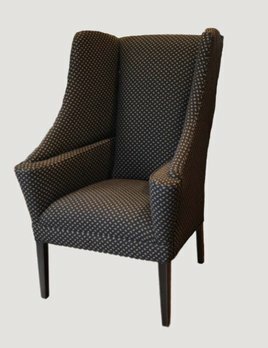 In Snowflake Black & Mustard fabric this chair is a traditional touch made of 8 way HAND-TIED coil spring seat foundation and other quality features. We offer Special Orders too! 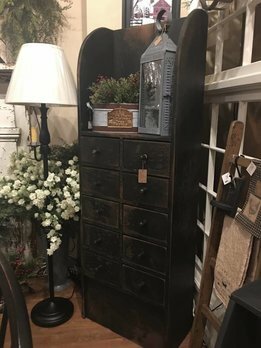 The Tall Apothecary Cabinet is a unique piece for most any space! 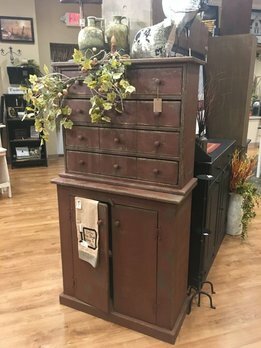 Made of solid wood with 10 drawers for storage this beautiful piece is also a display space on top. A really special design made in the USA.